You know that exercise they do in theatre workshops and in workplace groups to increase collective harmony and mutual trust among the members? Blindfolded or with our eyes closed, we let ourselves fall backwards, into the arms of the person behind us, who is waiting there ready to catch us. The only person into whose arms The Writer would have let himself fall backwards, blindfolded or with his eyes closed, was The Publisher. That was why, when The Publisher had invited him one bright Sunday to lunch in a restaurant not far from the Villa Borghese, even though it was a place they never went, The Writer had been trusting, and had let himself fall backwards into his arms. And when, after octopus in jelly with potatoes and a fillet of monkfish, a bottle of Sauvignon and another of Rhine Riesling, The Publisher had suggested they go for a walk in the zoo to clear their heads of the wine and pointless chatter, The Writer, even though he had found the suggestion unusual, had been as trusting as before. And again he had let himself fall backwards into The Publisher’s arms. The big, dark birds looked like monks sleeping on the roofs of their hermitages. The Writer was surprised by this statement and looked at the aviary with closer attention. A falcon (Falco peregrinus) was cleaning its feathers with its beak, hiding its head beneath its wing. A condor (Vultur gryphus) with an obscene bare neck was scouring the ground in search of leftover food. The Writer watched as a majestic eagle (Aquila chrysaetos), sitting dark and motionless on a branch, let out a powerful stream of excrement that fell to the ground like huge drops of rain after a tremendous drought. The Writer didn’t know that. “How many votes do we have?” he said, in order to change the subject and chase from his mind the image of those mangy crazed foxes, walking round in circles behind the barbed wire. The Writer laughed, though he wasn’t sure it had been a joke. The Writer did not take offence, but those angry foxes grinding their teeth behind the barbed wire had appeared in his mind again. Rabid foxes were throwing themselves against the electrified fence of The Writer’s thoughts. The Publisher took him by the arm and started walking, pulling The Writer’s compliant body after him. The two men began circumnavigating the aviary. The Publisher stopped—they had now walked halfway round the aviary—then resumed walking, again slowly dragging The Writer with him. “As long as there’s a net,” said The Writer, interpreting the audience’s thoughts. The two men fell silent. They had done a complete circuit of the aviary and had come back to their starting point. Were there foxes in circuses? Trained foxes? Were there even such people as fox-trainers? The Writer wasn’t sure. It might be impossible to train them, but surely they could be tamed. Once, as a child, he had seen a fox come and eat at the back of a restaurant, taking the food from the hands of a kitchen porter who had managed to overcome its mistrust. Word had got around and people talked about the restaurant more because of that tame fox than because of the cooking, and over time the kitchen porter had ended up becoming more famous than the cook. The kitchen porter had continued putting aside leftovers, until one day he had waited a long time but the fox had not appeared, and was never to appear again. The Publisher resumed his speech, shooing the foxes away from The Writer’s thoughts with a stick. The Writer said a number that wasn’t too far from the truth. “When the time is right, when the time is right… Look.” The Publisher pointed at a sleepy eagle which had broken the enchantment of the aviary by throwing itself on the condor: it was flapping its wings and jabbing with its beak, trying to tear a fragment of rotten flesh from the claws of that lugubrious road-sweeper. The Publisher and The Writer headed for the exit. “And how are you getting on with the next one?” said The Publisher just before stepping into the chauffeur-driven saloon that was waiting for him outside the zoo gate. The Writer was distracted: he was thinking again about the birds of prey dozing slothfully on their perches. Filippo Bologna was born in Tuscany in 1978. He lives in Rome where he works as a writer and screenwriter. His debut novel How I Lost the War is also published by Pushkin Press. Howard Curtis is a prize-winning translator of French, Italian and Spanish literature. He has more than twenty years' experience translating both contemporary and classic fiction and non-fiction, and his most recent work for Pushkin Press includes Filippo Bologna's The Parrots and How I Lost the War (shortlisted for the Oxford-Weidenfeld Translation Prize) and Pietro Grossi's Enchantment, Fists (shortlisted for the Independent Foreign Fiction Prize) and The Break. It's often said that poetry can't be translated, but poetry itself is an act of translation, as the alchemist poet attempts to transubstantiate external and internal realities into verbal structures. This is why poetry, like alchemy, is an art defined by failure. Translating a poem from one language to another is relatively easy, both being base metals, but nettlesome nonetheless. Pitfalls abound: individual word choices; syntax; rhythms and/or metre; rhyme schemes and other patterns of sound. To say nothing of peculiarities of diction related to regional dialect, idiomatic expressions, the neologistic predilections of the poet (many of whom have cultivated a highly personal idiolect), the passage of time, etc. What's remarkable—as with most human undertakings—is how miraculously well poetry translation often works. When Colin Carberry, who knows the highs and lows of translation as well as anyone, invited me to take part in the Linares International Literary Festival, he asked that I come with poems translated into Spanish. My first step was finding a translator. I needed someone who could do better than make an accurate prose paraphrase of my poems in Spanish. I needed someone with an ear for poetry, who would be able not only to convey the sense of my poems, but who could also convert their rough Anglo-Saxon music into the melodious cadences of Spanish. The last thing I wanted, after travelling some 5,000 km, was to sound lame. I put out feelers and got a few leads. The most promising came from Stephen Henighan, who introduced me to Lidia Valencia Fourcans, a former student of his at the U of Guelph. Lidia, a professional translator originally from Mexico City, had rendered a story of Stephen's into Spanish when he had read in Linares a year earlier and he said she'd done a very fine job. I finally chose nine poems from the book that I thought strayed the least from Standard Written English, and added “Waypoints,” an unpublished poem dedicated to Elizabeth Bishop, who loved Mexico. I sent the works off to Lidia. When she returned the first draft of her translations, I learned that my poems were more nodular than I'd thought. My knowledge of Spanish—acquired from a Mexican friend in high school who taught me to swear and from a first year Spanish class I took at the end of the last century—is extremely crude and Lidia's English is very good, but I knew enough to recognize a few instances of mistranslation. One culprit: idiomatic expressions. The sort of dead metaphors that native speakers of a language take for granted, but that second language speakers have a devil of a time (e.g.) mastering. So, for instance, “fag ends” became literal cigarette butts and “rest your bones” was “descansar tus huesos,” which I was pretty sure wasn't a colloquial equivalent to the English phrase it reproduced in good faith. And then there were the obscure words (“pardic”) and neologisms (“scudged”) where all poor Lidia could do was insert an ellipsis in square brackets. In a couple of poems, knottily recursive syntax left her unsure how to parse the originals. So I went back to my own poems with fresh eyes, hunting for anything that might be ambiguous or otherwise problematic, and returned them to Lidia, heavily annotated. Working with Santiago Hernán Sicilia, whom she'd recruited to help her, Lidia produced not just one set of translations, but the two versions she describes below, along with a comprehensive set of notes explaining various choices. The poems still hadn't gelled completely, but we were getting there. The final step was, of course, reading the poems to real live Mexican audiences. In doing so, I learned something else about translation. In my poem “What He Found Growing in the Woods,” I describe slugs as “creeping beads / of cool snot,” a line that occasionally elicits mild disgust in those who hear it. The translation of that phrase, “reptantes gotas / de moco fresco,” which sounds to my ear like something a Starbucks barista might whip up on a sultry afternoon, is, it turns out, hilarious to Mexicans; it got laughs every time I read it. Lidia explained that it was a cultural thing; that Mexicans would not expect to encounter such a dirty image in a poem, hence the giggles. I suspect it has as much to do with the music of the thing, the comic assonance in those repeated R's, E's, T's, C's and O's. Every now and then, something unexpected is gained in translation. Poetry is probably the greatest challenge a translator can undertake, no matter the language or cultural context. The translator has not only to render the text accurately, but has to come up with an interpretative recreation of the original. This is not likely to happen while translating legal or technical documents, and certainly it is a risk no translator would consciously take with such documents. The hardest challenge of poetry translation is walking the line between faithful reproduction and free recreation. It might be impossible to render a text with the same grammatical qualities, rhythms and rhymes, but when a translator allows herself many stylistic differences the result is a recreation of the original instead of a translation. Most of the challenges I faced while translating ten poems by Zachariah Wells were related to idiomatic peculiarities. In certain cases, it was very difficult to find words with identical meanings, connotations or even associations. That is why it took a tremendous amount of time and discernment to make accurate word choices. Also, the ambiguities of syntax and punctuation were an interesting problem. Poetic language has rules of its own. Therefore, it is not simple to translate its syntax, rhythms and phonetic aspects from the original to target language. Spanish does not have much in common with English, as it has with other romance languages such as Italian, Portuguese and French. Hence it was more complicated to capture the “earthy” voice of the poems' lyric subject and all the syntactic ambiguities of the original. What I saw in these poems was a natural, "colloquial" lyric subject who was not very engaged with poeticism, but at the same time was very precise in his descriptions of places, objects, feelings and nature. The dialogue between the lyric subject and the reader is well defined, in both the original and the Spanish translation, by the use of a particular register and even a regional accent. The hardest part for me was to translate not only the meaning and the poetic expression but the style too. That is why I decided to work on two different versions. The first version was more elaborate, maintaining the meaning of the poem, but focused mainly on the poem's stylistics. This translation took place more at the level of ideas than language. The second version focused on the use of language and fluidity of the poems in Spanish. The first version lacked literality but I kept the translation as faithful as possible to the original. No matter the stylistic differences, it was still a translation from the original, not a recreation. The second version was a more literal translation. It did not have many variations in the word choices and phrasal combinations but it lacked Spanish fluency in the poetic lines and had an impoverished rhythm. I was very fortunate to be able to question and discuss everything with the author throughout the translation process, which provided me with better insight into the essence of the poems. At the end I was very pleased to have a final version that stylistically and linguistically captured the essence of the original version in English but in the beauty of the Spanish language. Overall, it was a very enriching experience for me as a translator and as a poetry lover. The following translations were published in Ten Poems / Diez Poemas by Cactus Press in a signed and numbered edition of 100. Copies can be ordered from Zachariah Wells. Green air and a rusty babble. coating a dam of fallen tree rubble. and credentials. Flowers where a fire once burned. of hair and the first faint traces of stubble. Aire verde y un susurro mohoso. brotando en helechos de hoja amarga. cubriendo un dique de árboles caídos. y logros. Flores donde antaño ardió la brasa. y los primeros bosquejos de barba. Zachariah Wells is the author of the poetry collections Unsettled and Track & Trace; co-author, with Rachel Lebowitz, of the children's book Anything but Hank! ; and editor ofJailbreaks: 99 Canadian Sonnets and The Essential Kenneth Leslie. Over the past decade, his critical reviews and essays have appeared in numerous periodicals and anthologies in Canada and the US and he has won Arc Poetry Magazine's Critic's Prize four times. Originally from Prince Edward Island, Wells now lives with his family in Halifax, where he works as a freelance Zach-of-all-trades. Lidia Valencia-Fourcans was born in Mexico City and has lived in Mexico most of her life. After completing her B.A. in English with a minor in Literary Studies and Translation, Lidia traveled to Quebec in the summer of 2006 to learn French and be able to read some of her favourite poets in their original language. In 2011, she completed an MA in Latin American and Caribbean Studies at the University of Guelph, with a dissertation focused on solitude as a leitmotif in the poetic work of the contemporary Mexican poet Jaime Sabines (1926-1999). SHE DIDN'T KNOW HOW MUCH TIME had passed. A few seconds? A few long minutes? She felt nothing. Around her she heard voices, footsteps, people calling out, but all muted and grey, like a sort of auditory paste, from which occasionally a tram bell or a shout shook loose with unexpected clarity, only to fade away again into the suffocated commotion. They’ll say it’s an accident, she thought very calmly, almost with indifference. The thought made her feel neither alarmed nor hurried. She had a very vague impression that she must be stretched out next to the sidewalk with her head in the snow. But she didn’t try to move. A stupid, senseless question passed through her mind: What time is it? She strained to listen to the tick-tock of her wristwatch, but couldn't hear it. It must have been smashed. Then, in an effort to concentrate, as though immersed in herself, she observed that in fact she heard nothing of her own being; not her pulse, not her heart, not her breath. I’m..., she reflected. I’m like a clock. And it seemed to her that she was smiling, although she couldn’t feel her lips, for whose outline she searched in vain somewhere in that familiar yet vanished space that was her unfeeling body. She remembered suddenly the moment of the fall, so suddenly that she had the impression that she was falling again, and she heard again the brief noise, like that of a shattered spring, that she had heard then. She hadn’t dwelt on it at the time, but now it returned with an absurd precision: the dry sound of a tearing ligament, of a snapping bow. In truth it seemed to her that somewhere in the intimacy of this body that she no longer felt, something had been ripped out of its natural place. She tried to review her being, with a brisk inward glance, in order to identify, as though on an X-ray screen, the exact spot of the dislocation. The collar bone? The aorta? The kneecap? For each word, it seemed to her that she had to find a response in her inert body, which she listened to again, forcing herself to explore it with her hearing down to its most remote fibres. All right, something’s broken. But what? Voices rose and fell on the street around her in noisy outbreaks that suddenly became distant. They reached her as though passing through mist or steam. All at once she overcame the penetrating cold and at the same time she felt her right knee naked against the snow, as though it alone in all her body had awoken her from a powerful anaesthetic. So far away, yet how intensely she felt it! She concentrated her thoughts on this sensation for a moment. This single sensitive point felt extremely strange to her, detached from her swoon like a little island of life. Then, like a wave of blood, the cold rose above her knees and spread like a fine net through her calf, calling back to life new regions of her flesh. The snow was fluffy, soothing, and it had the softness of chilled bedclothes. She plunged her leg with caution straight into that snow and felt its utter nakedness, her stocking having fallen to her ankle. In that moment, the tearing sensation of a few seconds earlier flashed through her again. Her mind, which had hesitated until now, located the exact point of the torn piece of her anatomy: her garter. Having broken loose, its metallic spring pressed up against her calf like a small round signet. I must be half naked, she thought without panic. She had barely lifted her head when the voices grew clearer, as though the mist had suddenly dispersed. The tram driver gestured, trying to explain. “She doesn’t have the right because this isn’t a stop,” somebody else said, in a tone of indifference. From the ground, she tried to see the person who had spoken, but in the darkness she could only make out an expression lacking in curiosity. “Of course it’s not a stop,” the driver repeated, mildly encouraged. The elderly gentleman, indignant, refused to back down. She became aware of a smile that fluttered in the dark and, without raising her head far enough to receive this smile full in the face, was certain that it belonged to the indifferent voice of a moment earlier. He was stupid, certainly, but she realized that, sprawled there in the snow, she wasn’t listening to the strident voice of the outraged old man, but rather to the other man’s distant silences. Finally she heard again the other man’s voice, that slightly deaf, slightly lazy voice. He was probably speaking to the tram driver. Everyone gazed in her direction. In the heat of the argument she had been forgotten, but now she once again became the central character in the drama. She felt ridiculous, sprawled out as she was –who knew how long she’d been there?– in the middle of the street amid a group of curious bystanders. She would have liked to get up, but she knew she couldn’t do it alone. She glanced around in a circle, seeking a familiar figure among those grey faces, and stopped at the man whose lazy voice had caught her attention. She recognized him by his uncaring gaze, which bore a strong resemblance to his voice. The man didn’t look at all surprised. Without haste, he took a step towards her, paused, kneeled, placed his hand beneath her right arm and lifted her firmly, if without great deftness. She was unable to suppress a small cry of pain when, reaching a standing position, she was left with her full weight on her right leg. She felt that getting up had been a mistake: she had been more comfortable lying in the snow. For a moment she was tempted to tumble back down on the spot, a thought that made her smile and recover her calm. I’ve got to escape from this, she said to herself, confronting the group’s curiosity with courage. She returned to the man at her side, who also seemed rather embarrassed by the spectacle. She didn’t wait for his reply. She took his arm and set out alongside him, treading with care in order not to reawaken the pain of a few moments earlier. Neither a car nor a taxi could be seen. The young gentleman made no effort to conceal his boredom. He remained stubbornly silent, distracted. She would have been happy to leave him and continue on her way alone, but she didn’t trust her right leg. Twice she tried to tread with her full weight, and the pain sliced into her ankle like a blade. He’s been badly brought up, but I need him. She took his arm more firmly, as though she wished to show him that she wasn’t going to allow herself to be intimidated by his bad upbringing and that she wasn’t giving up. She walked a little behind him, not daring to tell him to take shorter steps. She was able to scowl at him in profile without his noticing. A drab guy, with undefinable features, young-looking, although not of any precise age; his hair looked blonde, although it wasn’t of any clearly defined colour. Maybe I’ve seen him before somewhere. Was he tall? Short? She wouldn’t have known what to say. He looked tall in that loose, grey overcoat with large pockets into which he had thrust his hands with a self-assured air. He remained silent, in the silence of a long journey, reserved, enduring, expressionless. It’s as if he were alone. As if I weren’t here by his side. As if he had forgotten that I was by his side. What if he really has forgotten? What if he wakes up and finds us arm-in-arm and asks me what I’m doing here, hanging onto his arm? She decided to break the silence. Hearing his voice surprised her. She thought he hadn’t heard her, that he wasn’t going to respond. Her surprise made her animated. They were passing beneath the pulsing of a streetlight. In the light, his face again looked distracted. What an unpleasant guy! Even so, she summoned the courage to stop. She bent over, realizing only now that she was bleeding: her right knee was red, but lower down, towards her ankle, where the scrape was deeper, frozen blood plastered the stocking’s fabric to the wound. He didn’t reply, but he took her arm and asked with his eyes: Which way? They crossed the street. From afar she found it difficult to recognize herself in the reflection in the pharmacy’s windows next to this man, who looked even stranger in the distant image on the glass. As she approached, she smiled with compassion at her own face. How pathetic I look, poor me! She took off her hat with a brisk motion and stood with it in her hand, dismayed. He accepted unenthusiastically, frowning with his brows. She was about to open her handbag to give him the money, but, without waiting, he pushed open the door of the pharmacy and went inside. From outside, she watched him through the pane of the display window: how he entered, how he took off his hat, how he said good evening, how he approached the pharmacist in his white lab jacket. She found it odd to watch him opening his mouth and uttering words that she couldn’t hear. What a peculiar voice he had! A little muffled, a little quashed, and yet with a rough tone. The pharmacist was pouring the tincture of iodine into a bottle. Why was he taking so long? It must be as hot as a greenhouse inside. The metal scales were still. The heavy liquids, as though drowsy, slept on the shelves in solemn crystal flasks. The pharmacist was asking him something and he was replying with plenty of enthusiasm. He was more talkative inside in the heat than he had been out here in the cold. And if she were to leave him? If she walked away now, without waiting for him? How astonished he would be at not finding her here, but what a feeling of relief he would have, the saucy devil! It was his voice. That uncertain voice, which didn’t stress his words and gave her the impression that he was walking at her side without paying attention to her. She didn’t reply and didn’t open her eyes. She didn’t expect even a polite denial from him. She took his arm, determined not to say anything more to him; she was impatient to be left alone. She forced herself to take ever longer strides, although her right leg was still hurting. For the first time since that stupid accident had happened, she felt like she wanted to cry. He squeezed her hand for a second without holding it, then touched a finger to his hat, sketching a vague half-wave. She wanted to tell him: You’re the most unpleasant man in the world. But she was too tired to tell him anything. She left him there in front of the building, and went into the bright foyer, where an enervating wave of heat received her. ....She was alone in the elevator. She pressed the button for the top floor, the sixth, then fell onto the bench with a relieved sigh. She promised herself she would cry with all her heart once she got to her apartment. She felt that nothing could be better for her: a good cry followed by a steaming hot bath. Somewhere between two floors the elevator stopped with a brusque shudder. At first she thought she had arrived, but she realized that in fact she was suspended in the air. This is the day for accidents. She tried to make a joke in her mind. She pressed for a long time on the alarm button. She remembered that last summer the old lady from the third floor had spent a whole morning locked in the elevator between two floors. The thought terrified her. She pressed again, with a long, nervous, harsh start of panic, on the red button. In the deep silence, everything was motionless; somewhere far away, as weak as a call from another world, the alarm bell rang without anyone responding to it. She could no longer hold back her tears. She looked at herself in the elevator’s rectangular mirror and felt pity for the state she was in: dishevelled, ragged, dirty, frozen. The hot tears welled from her eyes, and she received them with a sudden pleasure, as if she had drawn near to a warm hearth. The third-floor door was closed: the elevator set off noiselessly on its way. She would have liked not to stop again, to travel like that forever, and to be able to cry peacefully to the slow, silent movements of the elevator. On the top floor the young gentleman in the grey overcoat was waiting for her. She looked at him in astonishment, unable to understand what was going on. Indeed, he pulled two bottles out of his pocket enveloped in the pharmacy’s multicoloured paper. What an odd guy! she thought, watching him for a moment, intrigued again by his lack of expression. Now, too, he had that far-away, unquestioning gaze, which she had first seen when she had raised her head from the snow. She remembered that she had been crying. Embarrassed, she lowered her eyes; but it was too late: he had noticed. She took the key out of her handbag. He responded by lifting his shoulders. Mihail Sebastian (1907-1945) was one of the major Central European writers of the 1930s. Born in southeastern Romania, he worked in Bucharest as a lawyer, journalist, novelist and playwright until anti-semitic legislation forced him to abandon his public career. His long-lost diary, Journal 1935-1944: The Fascist Years, was published in seven countries between 1996 and 2007, launching an international revival of his work. Sebastian's novels and plays are available in translation throughout Europe, and have been published in Chinese, Hindi, Bengali and Hebrew. 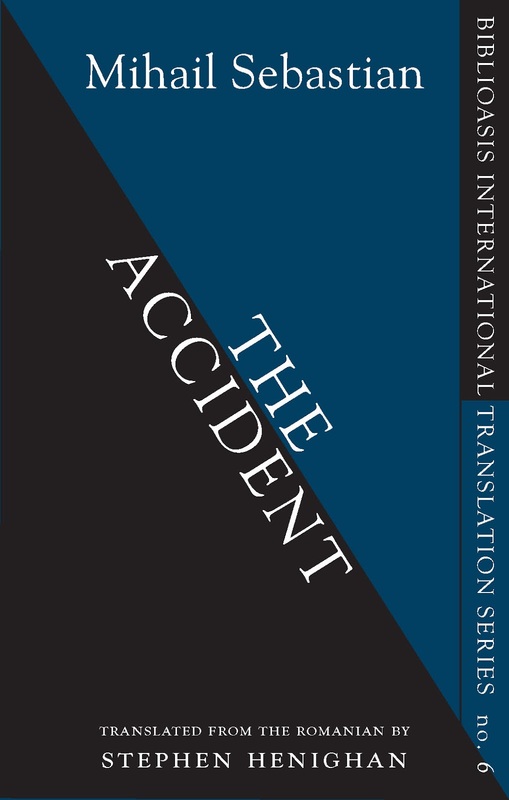 The Accident is Sebastian's first work of fiction to appear in English. Stephen Henighan’s previous translations include Ondjaki’s Good Morning Comrades and most recently, Granma Nineteen and the Soviet's Secret. He is the author of a dozen books of fiction, reportage and criticism, including the short story collection A Grave in the Air and the essay A Green Reef: The Impact of Climate Change. He teaches at the University of Guelph, Ontario, and is the International Translation Series Editor for Biblioasis.